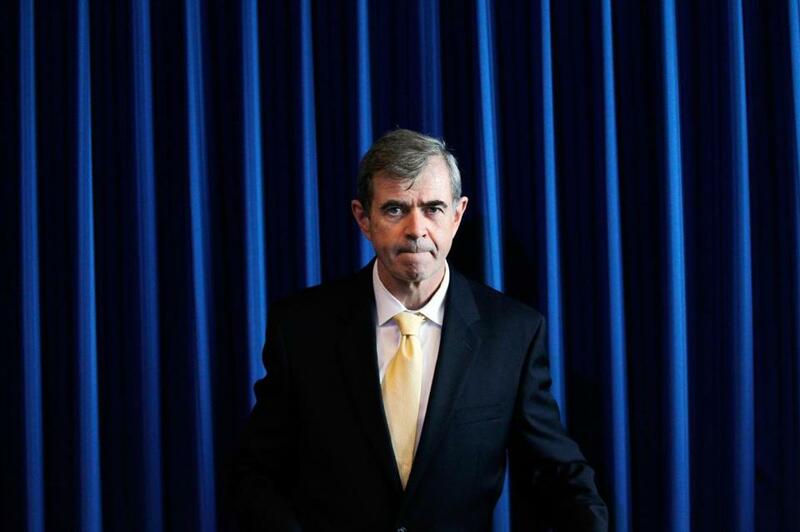 “Our goal is to get the public records made available if at all possible,” said William F. Galvin (above), the Massachusetts secretary of state. Secretary of State William F. Galvin’s office has long been the referee that journalists and citizens rely on when government agencies refuse to release records ranging from crime reports to internal audits. But time and time again, records show, his office has kept government information secret instead of making it public. Galvin’s office recently refused to help a central Massachusetts blogger obtain records for a 63-year-old murder case, records that would ordinarily be public. Galvin’s deputy ruled the State Police did not have to release the file because the investigation “remains ongoing” — even though the suspected killer died decades ago and police said they weren’t pursuing any new leads. “I think the state is in the business of protecting the state,” said a disappointed Craig Shibley, who publishes the Barre Muckraker blog. It’s not Shibley’s imagination: A Globe review of 50 of the most recent rulings by Galvin’s public records division found the office ordered agencies to release more documents or justify the fees they demanded only 20 percent of the time. Galvin’s own review found that the media companies, lawyers, activists, and others who have filed complaints this year got all the records they requested just 27 percent of the time. Critics say Galvin’s office, which is charged with overseeing the state’s public records law,is making a relatively weak statute even weaker by not doing more to make bureaucrats comply. The office often takes months to issue decisions, usually goes along with government explanations for withholding documents, and doesn’t enforce orders even when it rules that records must be released, according to the Globe review of appeals filed with the agency’s public records division. Galvin, a former state legislator who has served as secretary of state since 1995, insisted his office tries hard to help the public get access to records, but must work within the confines of the law and court decisions, which limit what records are public. “Our goal is to get the public records made available if at all possible,” Galvin said, adding that, in addition to ordering agencies to release documents, his office frequently helps negotiate agreements that get requesters much of what they want. Galvin, 63, said he doesn’t personally intervene in individual appeals and wasn’t even initially aware of the ruling to keep the 1951 murder records secret. Instead, he said, the decisions are made by Shawn A. Williams, the lawyer he appointed to serve as supervisor of records. “He makes his decisions as he makes them,” Galvin said. But Galvin is in charge. And he agreed with the decision to stop asking the attorney general’s office to enforce orders to release documents four years ago, even though his office receives more than 600 such complaints a year. Instead, Galvin’s office leaves it up to citizens to go to court to force agencies to comply with the rulings, something that can cost tens of thousands of dollars in legal fees. Galvin said the agency stopped referring orders to the attorney general because Martha Coakley’s administration indicated they were not a top priority. In addition, the attorney general’s office has refused to enforce some orders in the past because it disagreed with the secretary of state’s legal reasoning. A spokesman for Coakley’s office insisted that enforcing the public records law was a high priority. “We take our responsibility as chief law enforcement officer for the Commonwealth seriously, and any comment to the contrary is false,” said Christopher Loh. Galvin said he supports legislation that would give his office more power to take enforcement action, instead of relying solely on the attorney general. Compared with other states, Massachusetts gives citizens far less power to demand records from state and local agencies. The statute contains dozens of exemptions that allow agencies to refuse requests, and no clear penalties for violations, such as taking more than 10 days to respond to requests or withholding records altogether. The law also puts few limits on how much agencies can charge for records, sometimes leading to agencies demanding tens of thousands of dollars for documents that would cost a fraction of the price in other states. And unlike most other states, requesters in Massachusetts can’t even recoup their legal fees when they successfully go to court to obtain records. “The public records and open meetings laws of Massachusetts are among the weakest in any of the 50 states,” according to a national review by the Reporters Committee for Freedom of the Press in Arlington, Va. Nevertheless, many journalists and researchers have found the current public records laws instrumental to finding government waste and abuse. The Globe, for instance, has used public records to identify judges who refused to convict drunk drivers, track tax breaks awarded to corporations that produced few jobs, detail abuse of patients at Bridgewater State Hospital, and expose how investors exploited a loophole in the state Lottery to win prizes. And the law has helped many journalists and gadflies obtain records by allowing them to appeal denials to the secretary of state — a move that spurs many agencies to release the records even without a formal order. The secretary of state’s office also routinely reminds agencies that ignore requests or won’t explain their decisions of their obligations to follow the law. But when agencies stand their ground, the secretary of state’s attorneys usually side with their fellow government officials — including some rulings whose reasoning baffled media attorneys. In May, Galvin’s office rejected a request by Fox 25 reporter Mike Beaudet for a copy of a State Police report about a judge accused of taking a $4,000 Cartier watch from a security checkpoint at Logan Airport. Galvin’s office said the report could be considered confidential under a law that restricts access to individuals’ criminal history, but a First Amendment lawyer said that was a misinterpretation of the statute. “The public has the right to know that a judge was proposed to be criminally charged for larceny,” said Jeffrey J. Pyle, an attorney at Boston law firm Prince Lobel Tye LLP. The reporter eventually obtained a redacted version of the report from another agency, the Suffolk district attorney’s office, but without help from the secretary of state. Separately, the secretary of state has regularly ruled that police reports can be withheld so long as agencies say the investigation is ongoing — even in the long dormant case of a state trooper who was shot to death in Central Massachusetts in 1951. State Police spokesman David Procopio acknowledged the police are not actively investigating the case. Indeed, the man believed to have killed Patrolman Alje Savela died in 1960. The secretary of state’s office never explained to Shibley how releasing the 1951 murder records might pose any harm to the police investigation, and simply accepted the explanation that because the case was open, the records could be withheld. By contrast, a Hampden County Superior Court judge ordered similar documents released in a long-unsolved 1972 killing six years ago, noting that unveiling witness statements could prompt new witnesses to come forward. “It appears there was no meaningful analysis by the secretary of state,” Pyle said. In an interview, Galvin said police never told the secretary of state’s office the suspected killer died 54 years ago and that it wasn’t pursuing any new leads, or else it probably would have ruled differently. “It probably should have not been withheld,” Galvin said. He later said it’s clear that a police report must be disclosed once the investigation has ended. On the rare occasions that records requesters have gone to court after the supervisor of records refused to help, they’ve won some notable victories. Last year, in response to a Globe lawsuit, a Suffolk Superior Court judge ordered the state comptroller to reveal the names of people who received payments from the state’s settlements and judgment fund, overturning a ruling by the secretary of state. And in 2011, Slate editor Emily Bazelon successfully sued the Town of South Hadley to win details of a confidential settlement after the secretary of state’s office made no decision on the appeal for five months; she won the court case in just three weeks. But many observers say that the secretary of state isn’t the only one to blame for the frustrating process of obtaining public records. In many cases, local and state officials are slow to respond to calls from Galvin’s office, or provide new reasons for withholding records after the secretary of state gets involved. “My frustration lies with the Department of Labor Standards and other public officials who have refused to abide by the public records law,” said Ronald N. Cogliano, president of the nonprofit Merit Construction Alliance, who has had an appeal pending with the secretary of state’s office for four months. None of the complaints appear to have hurt Galvin’s standing with the public, where he remains one of the better known and liked Democrats in state office. Last year, a Public Policy Polling survey found 37 percent saw him positively, compared with only 15 percent who saw him negatively. Galvin has also breezed past his opponents in recent elections. In 2010, he received twice as many votes as his Republican challenger. This year, he is facing off against Malden City Councilor David D’Arcangelo, another low-profile Republican, who has criticized Galvin for his handling of public records cases. D’Arcangelo said Galvin demanded that he pay $5,300 for records on how Galvin’s office has spent money on advertising and marketing. “Bill Galvin has done a terrible job handling public records issues,” D’Arcangelo said. Galvin retorted that D’Arcangelo sought records going back two decades and hasn’t narrowed his request. Regardless, Galvin is widely expected to coast to reelection again this year, said Paul Watanabe, a political science professor at the University of Massachusetts Boston, though Watanabe wouldn’t completely rule out the possibility of a defeat. Todd Wallack can be reached at twallack@globe.com. Follow him on Twitter @twallack. Michael Levenson of the Globe staff contributed to this report.